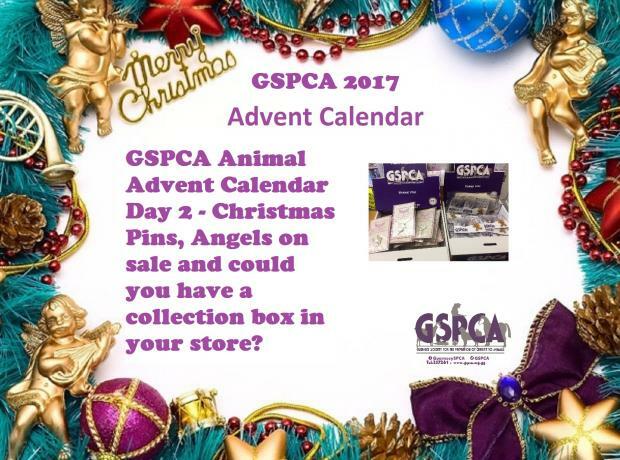 GSPCA Animal Advent Calendar Day 2 - Christmas Pins, Angels on sale and could you have a collection box in your store? The GSPCA now have three styles of Christmas pin badge designs on sale. If your office or shop could help with a counter box or collection tin we would love to hear from you. We now have a Christmas robin, snowman and gingerbread man on sale for only £2. The pin badges are set on a festive GSPCA card with a Christmas greeting and two designs having some Guernsey French on them. Not only are they now on sale at the GSPCA if your shop, business, school or office could sell in one of our counter box displays we would love to hear from you. Could your Business or Work Place sell our Season Greetings Robin Pin Badges to raise funds for the GSPCA? With less than two months to Christmas we are asking Businesses and Work Places if you could home a counter box for the GSPCA. We have Season Greetings Robin Pin Badges that need homes this Christmas for a minimum donation of £2 each. We are thankful to those that already support us with Counter and Collection Boxes that raise funds for the GSPCA.